Cast your mind back to June; remember reading about an app that used the iPhone’s GPS to bulls-eye the user’s location on any map imported into it? 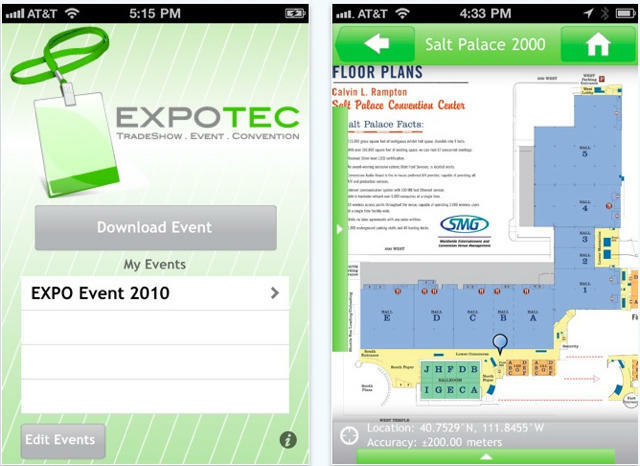 Well, the developer, Fog Technologies, is back with Expo Tec, an app that starts with the same basic principle, but narrows its focus to convention-like events and adds some features to help the user through his chaos-laden convention visit. The developer says it’s pretty easy for event planners to create “event packs” through a web interface designed for the app, which then shunts the pack to users of the app. Besides a GPS-enabled event map, the app provides event schedules, instant event updates, detailed vendor info and general event info. Expo Tec is $4, and boasts that it’s a “fist-in-the-industry” solution. Yeah, sure, it was probably supposed to read “first-in-the-industry,” but we like the fist version better; “we’re angry as hell (about getting lost) and we’re not going to take (poor convention info) anymore!” Or something.